On foot, on horseback and on the river. 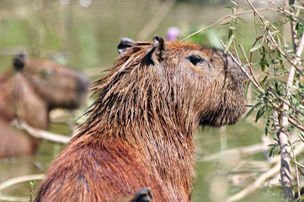 Did you know that the largest living rodent called capybara lives in the Pantanal? It is a close relative of the guinea pigs. With a bit of luck, we will see giant otters and tapirs. Did you bring your flashlight? Because it's quite possible that we will come across a tapir during the nightsafari on the river. On the nearby river Rio Claro we look out for the giant otter family. Don't be afraid of the riding tour, our horses are relaxed. Enjoy the sunrise of the wetland with its bizarre sounds at five o'clock in the morning. 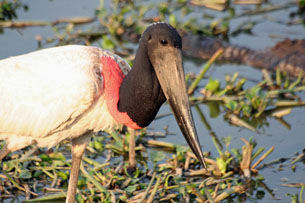 During 5 days you will be on the track of the giant bird Jabiru, the second largest in the Panatanal with its typical red collar. 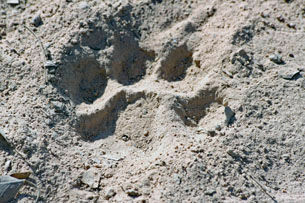 We will see hundreds of other animals. Don't be afraid of the numerous caimans lying lazily in the sun. This tour takes you through the wetland for 6 days. 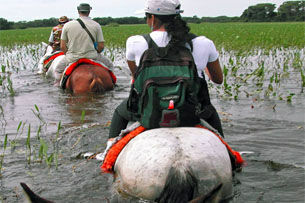 By boat, on foot and on horseback we explore the wildlife of the Pantanal. 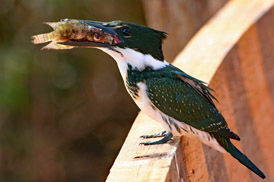 Around 600 species of birds live in the wetland. A car safari takes us to the Transpantaneira, a dusty road that crosses countless bridges, once intended as a link between Mato Grosso and Bolivia's borders. 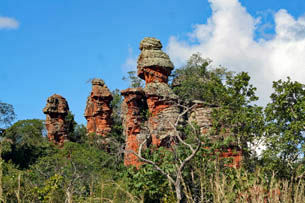 The Chapada dos Guimarães is a rocky plateau dominated by red. The 836m high table mountains let you look over gorges, caves, rivers and waterfalls. Further highlights of this tour are climbing a lookout tower, a boat trip, a car safari on the Transpantaneira and a riding trip in the wetland. You will get to know the Table Mountains with their rock sculptures and small waterfalls. 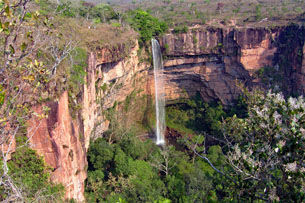 The large waterfall «Veu de Noiva» and the Mirante da Chapada, the geographical centre of South America, are also on the programme. To stroll through the Pantanal at five o'clock in the morning and see the sunrise surrounded by a huge concert of voices is a special experience. Our perfect tour for friends of fish and birds. 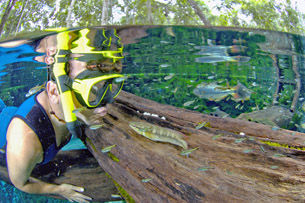 Near Nobres you will explore the underwater world and let yourself float leisurely down a crystal clear river. The chances of meeting Yellow-breasted Macaw and Hyacinth Macaw in the vicinity of the Pousades are high. Back in the Panatanal we may see howler monkeys. Immediately after arrival at the airport we go to Nobres, where we drive to «Lagoa das Araras». Hundreds of different bird species romp around there. Don't worry, we haven't forgotten the binoculars. On the following days you will go snorkelling with the fish in the crystal-clear river and visit the waterfall of the plateau with its blue lagoon. Let's hope to see a family of the Giant otters during a boat trip. The home of the Jaguar takes us deep into the branched river system of the Cerrado for two days on simple boats and equipped with the camera. The chances are high to see this magnificent predator. For the rest of the days you can explore the surroundings of our fazenda on foot or on horseback. The whole range of typical pantanal animals like the caiman, capivaras (capybaras), jabirus (storks), anteaters, nandus (ostriches) and many more will hopefully be in front of your camera. This tour takes us to the Table Mountain. At the geographical centre of South America you have a wonderful view of the plain 836 m below. You float in the glassy river in the middle of a forest and swim with the fish. In the Pantanal you can explore the richest wetland biotope in South America on foot in a boat or on horseback. 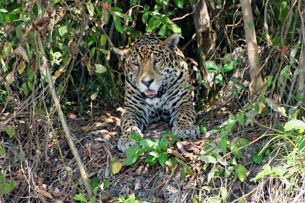 The Jaguar Tour takes you to Porto Jofre, deeper into the Pantanal to catch the Jaguar on boats. The tour also offers time for excursions on foot to the nearby gallery forest, where howler monkeys live. This journey takes us to the place where South America would be balanced on the top of a compass, to the geographical center of the continent. Besides a fantastic view of the lowlands, you will explore the 70m high bridal veil waterfall. In Nobres you will swim in a crystal clear river with the fish. There are even white freshwater rays at the bottom of the river. In the Lagoa Azul many different kinds of parrots will play their loud concert for you. 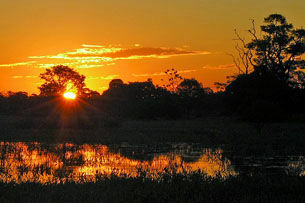 The last two nights you will see the most species rich wetland, the Pantanal, with hundreds of animal species. We will move on horseback, by boat and on foot. There giant otters and caimans swim in the river. 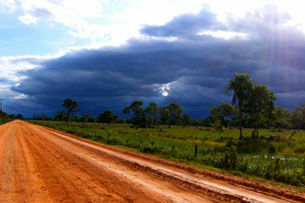 This full day tour takes you deeper into the Pantanal to Porto Jofre. On simple boats you'll be looking for the Jaguar for about five hours. This river systems of the Cerrado is huge and rich in caimans. Sometimes the 270cm long big cat even catches caimans from the rivers. 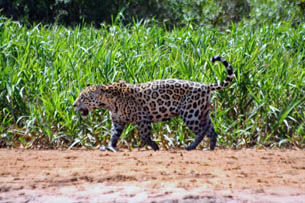 The beautifull spotted cat is called «Onca» in Brazil. Of course, there is a good chance to meet many other wild animals, such as the capivaras, the giant otters, the anteaters and the tapirs. About 640 bird species also live in this large alluvial land. This tour can also be combined with the other tours, depending on availability.